Black hair – in all of its glory and natural styles – was on display Wednesday, Feb. 17 at Southern Illinois University Edwardsville. A series of nine display panels highlighted images of various natural hairstyles worn by multi-generations of African American women and was presented by Howard Rambsy, PhD, associate professor in the Department of English Language and Literature. “The goal was to raise awareness about the defining ways that varieties of black women present themselves to the world,” Rambsy said. “The exhibit gave me an opportunity to let collegiate black women on campus know that their approaches to style and aesthetics are recognized, valued and intellectually engaging. 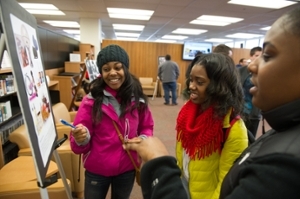 L-R: Enjoying one of the displays are Stephanie Redfield, Lakia Day and India Gilbert, all freshmen in the College of Arts and Sciences.